A signed copy of the rental agreement must be presented upon boarding the Party Life Bus! Renter must be 21 years of age or older. Valid identification must be provided prior to renter boarding the bus. The renter is responsible for all activities of the passengers aboard the bus. This includes any conduct that could result in legal action taken on behalf of Party Life, LLC. A $100 (15-16 passenger) or $150 (17-25 passenger) non-refundable deposit is required to secure/reserve your specific rental date. Deposits are accepted via cash, check, paypal, debit/credit card or Cash App. A fuel surcharge is also factored into the total rental price based upon the clients itinerary and location. **Deposits that warrant a refund are solely at the discretion of Party Life, LLC. In the event of severe weather or a cancellation on the end of Party Life, LLC a refund will be deemed necessary for all funds including deposit. **Severe weather being considered an official “Severe Weather Warning” issued by any local television network or the National Weather Center (NWS). Full payment must be received prior to boarding the bus. Full payment can also be made by check, money order, or cc in advance, however checks must be received at least 14 days prior to your event date. All cancellations must be made 48 hrs. prior to event date or the full amount of payment will be required. 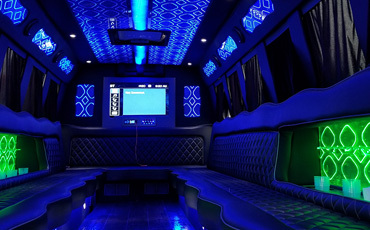 In the event Party Life, LLC cancels the reservation the clients’ deposit will be refunded. If there is any damage to the bus or excessive cleanup is required, a damage assessment will be made and additional charges may be placed upon the renter to cover the cost. Any damage assessment will be determined once the bus has returned to the shop and has been thoroughly cleaned. **There is a $100 cleaning surcharge for vomit incidents. Party Life, LLC is not responsible for lost, damaged, or stolen property. We ask that all renters remove any items considered of “value” from the bus upon exiting at all times. Client participation in any photos taken by staff implies consent to post or share for marketing purposes via social media, company website or any other marketing platform. Alcoholic and non-alcoholic beverages are permitted aboard the bus. However, by law, Party Life, LLC cannot sell alcoholic beverages to renters. Renters may bring their own alcohol aboard the bus as we provide a built-in cooler for beverages to be stored aboard. Also, renter is responsible for making sure that all passengers who consume alcohol while aboard the bus are 21 years of age or older. Violation will result in immediate termination of contract with no refund. Again, anyone consuming alcohol while aboard the bus MUST be 21 years of age or older. NO SMOKING ALLOWED. Violation will result in immediate contract termination with no refund. NO FIGHTING will be tolerated. Violation will result in immediate contract termination with no refund. NO WEAPONS allowed aboard the bus. Violation will result in immediate contract termination with no refund. NO DRUGS allowed aboard the bus. Violation will result in immediate contract termination with no refund. Renter shall indemnify and hold Party Life, LLC harmless from and against any and all suits/actions, damages, liability or proceedings that may occur aboard and/or near the bus. I, the client/renter, have read and understand the rental agreement and accept the terms & conditions stated herein. ** We’re more than transportation we’re an EXPERIENCE! !